The United States has announced new sanctions on three Venezuelans and 20 companies for connections to drug trafficking. Vice President Mike Pence announced the measures earlier this week. He spoke during a visit to the headquarters of the Organization of American States, in Washington, D.C. 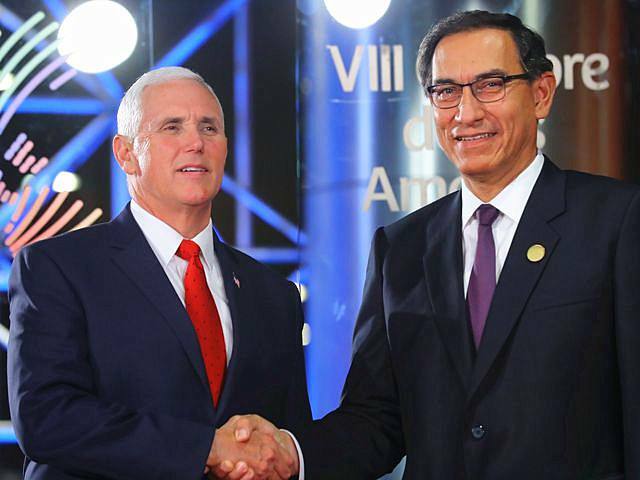 In his speech, the vice president condemned the government of Venezuelan President Nicolas Maduro. Pence warned that Venezuela's next election would be a "fake election with a fake outcome." He called on Maduro to postpone the vote. Pence said, "Hold real elections, give the people of Venezuela real choices, because the Venezuelan people deserve to live in democracy once again." In January, the U.S. government announced steps against four current or former Venezuelan officials with links to corruption or repression. The crisis in Venezuela has led thousands of people to flee the country. The International Organization for Migration says that between 2015 and 2017, the number of Venezuelan immigrants in Latin America increased from 89,000 to 900,000 people. That represents an increase of more than 900 percent. Many people have left because of concerns about security, crime, shortages and inflation. This week, the Vatican announced a plan to help those Venezuelans moving overseas. The Vatican's Office to Promote Integral Human Development is working with Roman Catholic officials in eight countries on what is being called the "Bridges of Solidarity" project. The eight countries are Ecuador, Colombia, Brazil, Peru, Paraguay, Chile, Bolivia and Argentina. Services offered through the project include building shelters and centers for the immigrants, as well as help in finding housing and jobs for them. Vatican officials say one goal is to assist the migrants with education and healthcare. Another is to provide support and legal assistance to them. For the past several months, Pope Francis has expressed his growing concern for the Venezuelan people. Earlier this year, the pope spoke about Venezuela to Catholics gathered in Saint Peter's Square. He appealed for an end to violence in the country. He said, "I assure my prayers for this beloved nation, and express my closeness to the families that have lost their children in the riots." The Vatican's office for migrants and refugees will be making available nearly $500,000 a year. The aid is to be spread among the eight nations involved in the project. They were accused of corruption and drug trafficking and sentenced in absentia. Many of the cases now paid for are straightforward and do not need legal assistance, the government thinks. It is necessary to establish medical aid program for the poor, in order to set up harmony society. 5.Pence said, "Hold real elections, give the people of Venezuela real choices, because the Venezuelan people deserve to live in democracy once again." Once again he has broken his faith with them. Can I come back to the question of policing once again? 6.Services offered through the project include building shelters and centers for the immigrants, as well as help in finding housing and jobs for them.